Class 2 had a visit from a local artist, Peter. He showed us lots of different works of art and we had to be picture detectives e.g. Finding a painting with a horse in, a painting with a storm. Then we worked together to create our own picture. It was lots of fun! Class 2 went on a lovely visit to Harewood House at Christmas. We saw lots of decorated Gingerbread men in the kitchen. We learnt the story of the Gingerbread Man for our assembly. It was lots of fun! As part of our science topic on materials, Class 2 went to Leeds Minster to investigate the different types of materials we could find. We had great time! Class 2 had a lovely trip to Harewood House learning about Christmas in the past. We looked around the beautiful house which had been decorated for Christmas. After that we made some bird feeders which we hung on the tree by the lake. Then we made a Christmas lantern with a real light. Finally we drank some delicious hot chocolate - it was the best day ever! Class 2 had an excellent trip to the Abbey House toy museum as part of our topic on Toys from the Past. We had the chance to handle toys that were over 100 years old. Class 2 having been learning about the story of Guy Fawkes in history. We had a special visitor who dressed as Guy Fawkes and told us the story of how he was going to blow up the Houses of Parliament. He brought lots of different objects to show us. It was very interesting. Class 2 had their first cookery lesson with Mrs Swailes. They made fruit smoothies and were very proud of their smoothie moustaches! Class 2 had a wonderful day at Thwaite Mills, mini beast hunting and pond dipping. It was great fun and we learnt a lot. After our delicious picnic we spent the afternoon making butterflies with pipe cleaners. We loved it! As part of our seaside topic, we have been learning about seaside entertainment in the past. We really loved watching the puppet show and learning about the history of the puppets. As part of our science topic, we have been learning about the butterfly life cycle. We had our own caterpillars that turned into papas. Finally they hatched into painted lady butterflies. We released them into the school playground. We had a great time visiting Filey as part of our history and geography topic. We made sand castles, buried each other in the sand, played football, splashed in the sea and ate ice cream. It was the BEST day ever! Class 2 did an excellent assembly last week about animals and their offspring. They acted out the Julia Donaldson story Monkey Puzzle and sang a Monkey Puzzle song. They did a great job and the teachers were all very proud. As part of our science topic, Class 2 have been exploring different micro habitats in the school playground. We had great fun searching for different minibeasts. Class 2 have been using their programming skills to direct the Bee-Bot around the mat and the hall. We had lots of fun! In Science, we have been learning about eating healthily and eating food from different groups. We created our own 'healthy eating' plate. As part of our geography topic about Katie Morag, we have done some work in art using watercolour paints to create a landscape. It was tricky, but we had fun. Class 2 had a fabulous, snowy time at Skelton Grange on our Survival Adventure day. It was part of our science topic - the basic needs of livings things. We learnt to work as a team to 'cross a river' and built dens and fires to keep warm. We really enjoyed toasting marshmallows and making popcorn on the fire. What a great day. Class 2 did a lovely assembly about the work we did in Literacy. They acted out the story of The Hare and the Tortoise, The Owl and the Pussycat and A Squash and a Squeeze - it was great! Mrs Smallwood was very proud of them. Class 2 had an excellent morning at Leeds Minster as part of our science topic on materials. We looked around the church at the different materials- there were lots to find! Then we used wax crayons to do brass rubbings. It was lots of fun! Class 2 have been learning about the Gunpowder Plot. We had a visitor who dressed up as Guy Fawkes and told us the story - it was amazing! As part of our topic on toys, we worked with our friends to sort toys into different categories. Class 2 had a brilliant time learning all about India in International Week. We painted mango prints in art and created Rangoli patterns on the computer. On Friday, we enjoyed dressing up in our clothes from around the world. We started International Week by doing some fun Brazilian dancing called capoeira. It was very energetic. As part of our topic on toys, Mr Walbank came and told us about the toys and games he played with when he was a child. We were able to ask him lots of questions. We really enjoyed our trip to the toy museum. There were lots of old toys and replica toys to look at. Some of us even had the chance to dress up as Victorian children. We had a great time. In geography week, Class 2 have been learning about aerial photos and using co-ordinates to navigate around the playground. We even did a treasure hunt. We had a lovely time! Class 2 had a lovely visit to Thwaite Mills searching for minibeasts. We even went pond dipping and found tadpoles! In the afternoon, we made some butterflies and dragonflies. It was a really great day. As part of their topic learning about toys from the past, Class 2 went to Abbey House Toy Museum, where they got to play with lots of toys - comparing toys from the present to those of the past. They also dressed up as Victorian children and played with toys from that era. Class 2 were really enthusiastic about skipping day and were really good at learning the different skills. 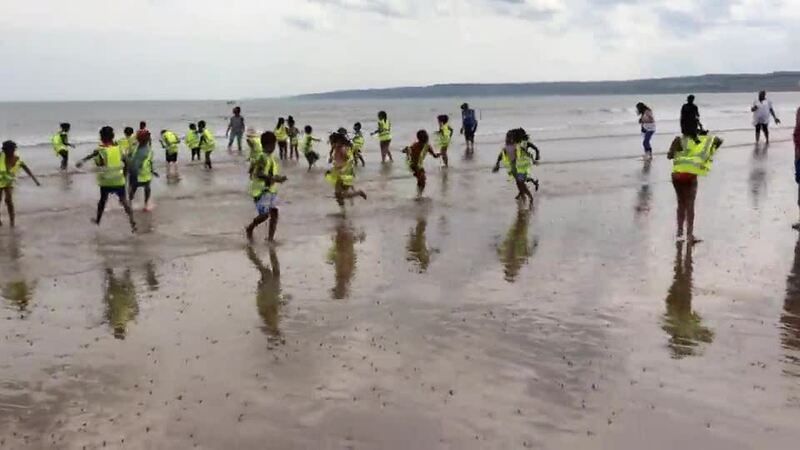 The children enjoyed a brilliant time at the seaside - the sun shone all day and the children made sandcastles, splashed in the sea, had an ice cream and buried each other in the sand - what a fantastic day! Class 2 had an amazing day out at Yorkshire Wildlife Park. As you can see, they saw lots of different animals and learnt all about them. Thank you so much to Variety Club for inviting us! Class 2 have been learning about minibeasts. We had some caterpillars, that turned into pupas and then butterflies. We released the beautiful butterflies into the open air. Class 2 had a brilliant PE lesson learning to ceilidh dance - they soon picked up the steps! We had a great afternoon looking for different materials around our classroom as part of our new science topic. Class 2 did a wonderful assembly about Traditional Tales. We acted out the story of the Three Little Pigs, Little Red Riding Hood and the Little Red Hen. We learnt lots of songs and poems. Mrs Smallwood was really proud of us! Well done. Class 2 were very lucky to be invited to the Variety Club Christmas Party at Elland Road. We watched a really funny pantomime of Cinderella. After that we ate a delicious lunch. In the afternoon, there was a disco where we did lots of fantastic dancing. Santa and Snowman even came to visit! It was a wonderful day.